Hand Selected, Premium pressure treated lumber on deck, fascia, posts, frame – better than Premium #1, the best lumber money can buy. Floor Decking is 2” x 6”, not 5/4”x 6”. 3-Layer laminated posts preserve beauty and durability for years without splitting that commonly (almost always) occurs with solid posts. 8” to 10” Top Plate (depending on size) which forms the ring around the gazebo between the posts, and the roof structure. Railings are each made using three (3) 2” x 4” sections (not 2” x 3”) for sturdiness, safety, and structural integrity. 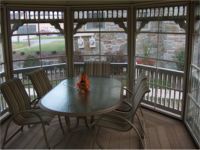 2” x 2” straight spindles, (the vertical part of the railings) are each machined/joined with a 22 1/2 degree slot. Spindles are each secured with 4 stainless steel finish nails. Ceiling is pressure treated Tongue & Groove.